Use this video as a motivational starter or closer at any corporate gathering. Use its principles as the foundation in a team building session. This moving and stimulating video will give your conference or training session a whole new impetus. In just over 2 minutes it teaches five key lessons for every team in a moving and musical way. 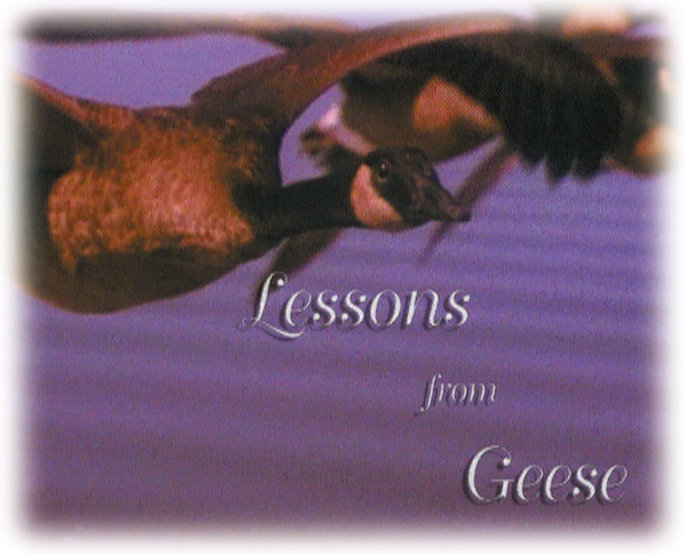 Against the musical background of ‘Groovin with Mr. Bloe’, it shares dramatic footage of geese flying in formation to provide insights into the five lessons from geese. Use this video as a motivational starter or closer at any corporate gathering. Use its principles as the foundation in a team building session. Use it over and over with every group in your organization. It will lift the mood and help you develop commitment to peak performance, both within individuals and teams.